The Royal Swedish Academy of Sciences has decided to award the Nobel Prize in Chemistry for 2009 jointly to Venkatraman Ramakrishnan, Thomas A. Steitz and Ada E. Yonath, “for studies of the structure and function of the ribosome“. At the beginning of the twentieth century, the chemical foundations of life were mysterious. Today we know how many of the most important processes function, all the way down to the atomic level. 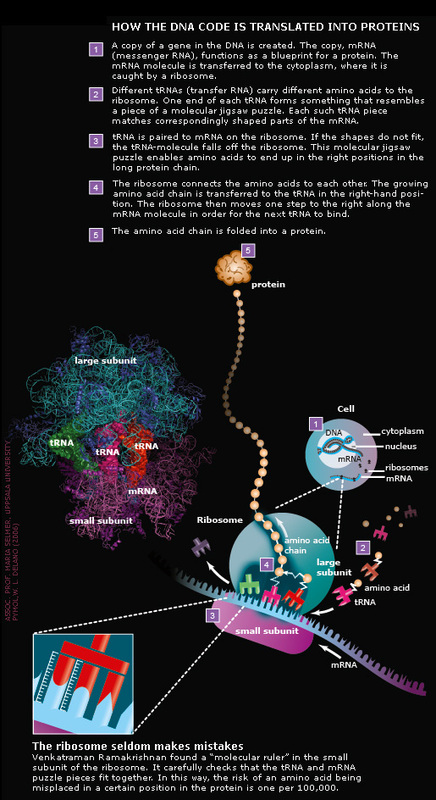 The 2009 Nobel Prize in Chemistry is awarded for the detailed mapping of the ribosome – the cell’s own protein factory. Proteins build and control life at the chemical level. As ribosomes are crucial for life, they are also a major target for new antibiotics. The story of the 2009 Nobel Prize in Chemistry begins in hot springs and in the Dead Sea. 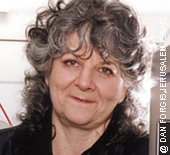 Ada Yonath used micro-organisms from these extreme environments to isolate robust ribosomes. Her goal was to make the ribosomes crystallize, like salt in a solution crystallizes when the water evaporates. After many years of trial and error, Ada Yonath managed to generate well organized crystals with millions of ribosomes assembled into regular patterns. 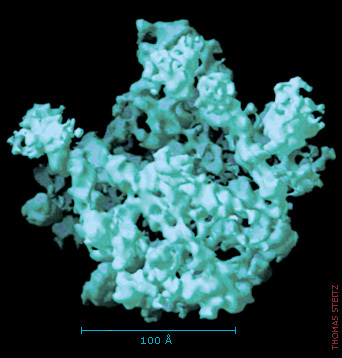 Ada Yonath sent X-rays through ribosome crystals. When the rays hit the crystal’s atoms they are scattered, making millions of dots on a CCD detector. This method is called X-ray crystallography. By analysing the pattern of the dots, researchers can determine the positions of the hundreds of thousands of atoms in the ribosome. However, scientists also needed to know the “phase angle” for each and every dot. This mathematical information is related to the location of the atoms in the crystal. 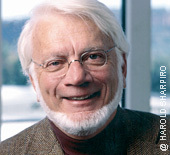 In 1998, Thomas Steitz managed to solve the phase problem and the first crystal structure of the ribosome’s large subunit was published. The first structure of the large subunit was like a dim photograph. 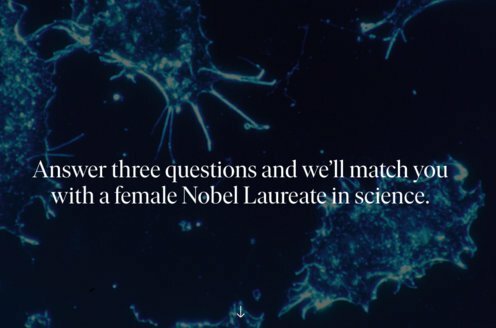 Researchers quickly improved the sharpness of the image, and during August and September 2000, each one of the Nobel Laureates published a crystal structure with a resolution that allowed the positions of single atoms to be determined. The human body is built from approximately one hundred thousand billion cells. Each cell contains thousands of ribosomes, which are composed of a small and a large subunit. The subunits are built from rRNA-molecules, constructed from nucleotides, and proteins, made from amino acids. Nucleotides and amino acids, in turn, are built from atoms. In all, a ribosome is built from hundreds of thousands of atoms. Thomas Steitz has taken snapshots of different steps in the chemical reaction where amino acids are connected. The reaction is catalysed by the large subunit. Thanks to work of Thomas Steitz, scientists now know which atoms in the ribosome are involved in the various reaction steps. In the human body there are tens of thousands of proteins that build and control life at the chemical level. Examples of proteins are oxygen-transporting haemoglobin, hormones such as insulin and the antibodies of the immune system. Proteins are built from 20 different kinds of amino acids which are linked together in long chains. A protein chain can consist of anything from ten to tens of thousands of amino acids. All three Nobel Laureates have generated structures showing exactly where different antibiotics attack bacterial ribosomes. Some antibiotics inhibit the monitoring mechanism of the molecular ruler (see illustration above), others hinder the formation of the connection between amino acids or block the tunnel through which the emerging protein chain leaves the ribosome. The exact knowledge of where antibiotics bind to the ribosome helps scientists develop new and more efficient drugs. This is expected to save many human lives in the future. US citizen. Born in 1952 in Chidambaram, Tamil Nadu, India. 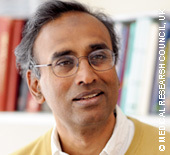 Senior Scientist and Group Leader at Structural Studies Division, MRC Laboratory of Molecular Biology, Cambridge, UK. US citizen. Born in 1940 in Milwaukee, WI, USA. Sterling Professor of Molecular Biophysics and Biochemistry and Howard Hughes Medical Institute Investigator, both at Yale University, CT, USA. Israeli citizen. Born in 1939 in Jerusalem, Israel. Martin S. and Helen Kimmel Professor of Structural Biology and Director of Helen & Milton A. Kimmelman Center for Biomolecular Structure & Assembly, both at Weizmann Institute of Science, Rehovot, Israel. Editors: Måns Ehrenberg and Gunnar von Heijne, the Nobel Committee for Chemistry, Ann Fernholm, Katalys Media, Annika Moberg, Editor and Ylva Sjöberg, Nobel Assistant, The Royal Swedish Academy of Sciences.